Students at the University of Warwick have passed a vote of no-confidence against their Vice Chancellor Sir Nigel Thrift, citing his abuse of powers following a brutal police crackdown on a student protest last year. Warwick Students’ Union issued a statement declaring the body now adopts the motion “No Confidence in Nigel Thrift” as policy. The motion, which was proposed by third-year politics student Miguel Costa Matos, passed with a 70 percent majority, gaining the support of 682 students out of 1120. It follows the creation of a petition on 38degree.org.uk calling for Thrift’s knighthood to be rescinded. The petition had 684 signatures as of Friday afternoon. Thrift, a leading scientist who has held posts at the University of Oxford and Bristol University, was awarded a knighthood last December in honor of his services to higher education. However, the student body accuses him of overseeing a university which curbs the salaries of academics and teachers, while he enriches himself and other senior management with lucrative pay rises. The Students’ Union motion also points to the brutal police suppression of a student protest against rising tuition fees on December 3 last year. At the time, a spokesman for Warwick University said security guards were subjected to a “shocking and unprovoked act of violence,” which prompted them to call for police. Activists said the protest was peaceful until they were besieged by security personnel and officers. 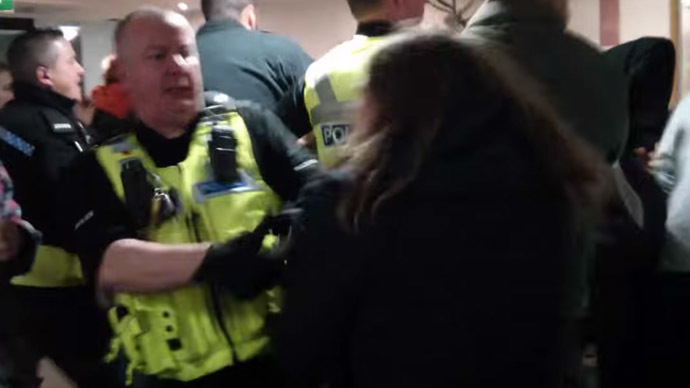 West Midlands Police were caught on video using tear gas and aggressive force to break up the demonstration, which took place inside the university’s Senate House. “Something has gone seriously wrong when students find themselves in opposition to university management. “In a functional education system, a university would be run in the interests of students and staff, rather than against them. Unfortunately, Nigel Thrift is evidence that this is not the case,” he added. Speaking to RT, History student Sam Lovett said: "I'm not surprised by the result - students have become increasingly dissatisfied with Nigel Thrift." "Alongside the repeated rise in his salary over the past couple of years the decision to award him a knighthood may have been the final straw for many students. It's safe to say many of us will be relieved when he departs from the University later in the year," he added. Thrift’s tenure at Warwick University has experienced a number of controversies, including the high profile suspension and subsequent reinstatement of literature professor Thomas Docherty. Docherty endured a nine-month suspension for “sighing” and giving off “negative vibes” during job interviews in a way which undermined the authority of Professor Catherine Bates, the former head of department. An outspoken critic of the marketization of education, Dochtery was eventually cleared of all allegations made against him by a university tribunal.